Letizia Moratti, President of Friends of San Patrignano, will be honored at the National Italian American Foundation’s (NIAF) 37th Anniversary Awards Gala in Washington, D.C. San Patrignano is the largest rehabilitation center for drug abuse in Italy. Ms. Moratti will receive the NIAF Special Achievement Award in Philanthropy on October 13, 2012, at the Washington Hilton. The black-tie event begins with a 6 p.m. reception followed by dinner and an awards ceremony. Honorees from Italy joining Ms. Moratti include Giovanni Ferrero, Chief Executive Officer of the Ferrero Group, and Accademia Nazionale dei Lincei, the oldest science academy in the world. They will be joined by Italian dignitaries including Hon. 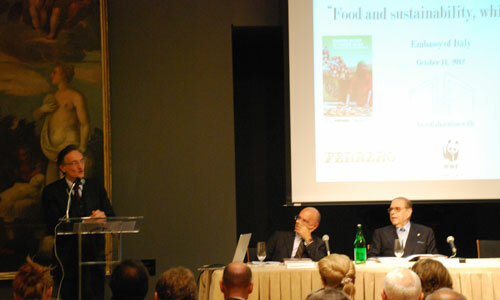 Claudio Bisogniero, Italian Ambassador to the United States, H.E. Giuliomaria Terzi di Sant’Agata, Italy’s Minister of Foreign Affairs and Hon.Giuseppe Scopelliti, President of the Region of Calabria. NIAF will also honor Geno Auriemma, Head Coach of the Gold Medal-winning USA Basketball Women’s National Team and Head Women’s Basketball Coach at the University of Connecticut; Mark Del Rosso, Executive Vice President and Chief Operating Officer of Audi of America; and Ralph Izzo, Chairman, President and CEO of the Public Service Enterprise Group Incorporated (PSEG). During the evening Patricia de Stacy Harrison, a NIAF Vice Chair and President and CEO of the Corporation for Public Broadcasting, will present Marco Simeon, Director of Government and International Relations at RAI, with a NIAF Special Recognition for International Media Relations. Twelve-time MLB All-Star Mike Piazza will serve as the evening’s master of ceremonies. John F. Scarpa, NIAF Board Member, is the chair of the Gala Weekend. Known as the “Renaissance Woman of Milan,” Ms. Moratti has become one of the world’s leading business women, according to Camera di Commercio Milano. Her leadership as president of Friends of San Patrignano led to the growth of the largest drug rehabilitation center in Europe. San Patrignano has changed the lives of more than 18,000 people by offering them a home, healthcare, legal assistance, jobs, and an opportunity to further their education. Ms. Moratti also serves as a member of the steering committee of Rainbow, the International Association Against Drugs, and was appointed Civic Ambassador of the United Nations Against Drug and Crime in 2000. Her international experience in finance, insurance and risk management, communication services, and new media has prepared her for many influential positions. In 1988, she became president of the Associazione Italiana Brokers di Assicurazioni Riassicurazione (Italian Insurance and Reinsurance Brokers Association). While in that position, she launched Ricerca Sistemi Pubblica Amministrazione (Public Administration Systems Research). In the early 1990s, she became vice president of the Federazione del Teraziario Avanzato (Advanced Services Federation). Ms. Moratti also served as vice president of UNI – Ente Nazionale Italiano di Unificazione (Italian National Unification Body) and has been a member of the Advisory Committee of the World Intellectual Property Organization, a specialized UN institution. Additionally, Ms. Moratti served as a member of the board of directors of News Corporation Ltd. USA, Britain’s BSkyB television network, and was the first woman president of RAI, the Italian broadcasting company. As president and managing director of News Corps Europe from 1998-1999, she created the European expansion plan to strengthen Italy’s position in the German market. She also served as Minister of Education, University and Scientific Research for the Italian government. On May 28, 2006 she was the first woman elected Mayor of Milan. During her tenure as mayor, she secured the bid for the city of Milan to host EXPO 2015. In addition to her many roles and numerous titles, she has been presented with honorary degrees and international awards, including the “Legion d’honneur,” the highest French decoration.